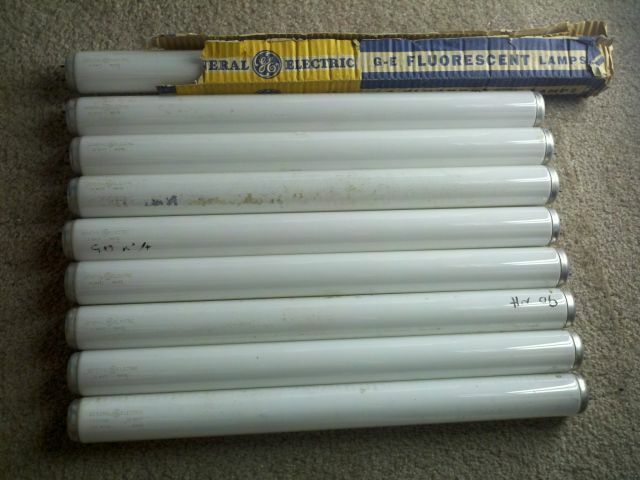 Lighting-Gallery-net - circline and u-bent fluorescent tubes/1950s GE fluorescent haul quite a find! 1950s GE fluorescent haul quite a find! 8 GE 15w Whites from 1951 and one GE 15w Cool White from 1959 (with ordering code). The 1951 lamps do not have notches in the end caps. All are NOS and work. Ventura CA thrift store find. Very nice tubes. I wish there were more T12 tubes here in Europe. I will get 25 Osram T12 20 Watts warmwhite tubes tomorow . @Prismatic: Aren't these Sylvania made tubes? Wow! What a haul! Is the CW from '59 or 69? Does it have solder dipped pins? @Jercar954 I thought it was '59 because of the brownish etch. No it doesn't have solder dipped pins. I'll bet it is '59. I couldn't tell from the picture that it has a brownish etch. Regardless, this is a WONDERFUL find!!!! Wow what a nice haul of beautiful tubes!